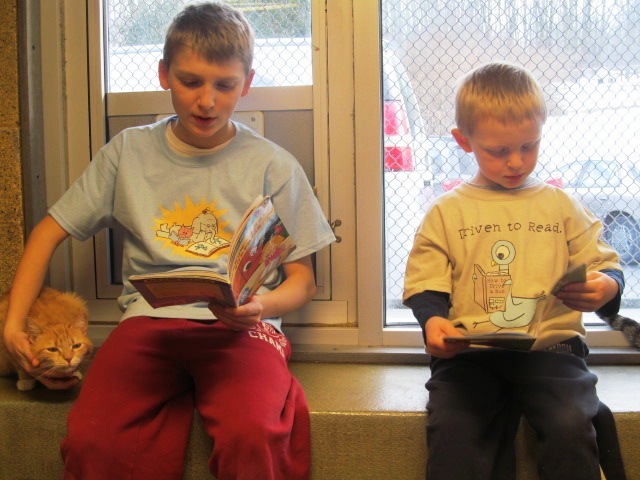 Look at this adorable photo of two Book Buddies wearing our Mo Willems t-shirt designs with Elephant and Piggie reading a book, and The Pigeon reading a book. Everyone is reading! On Valentine’s Day we wrote about the Book Buddies program at the Animal Rescue League of Berks County. 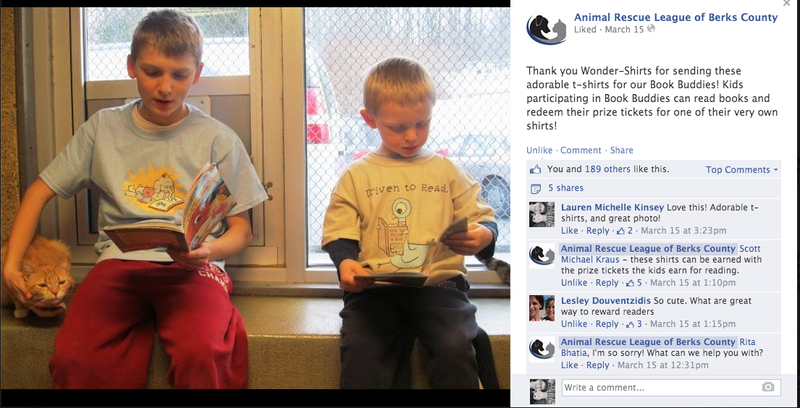 We sent them ten of our Wonder-Shirts t-shirts with illustrations from well known children’s book illustrators on them. They are using the t-shirts to give as prizes to the young people who are reading to cats in the shelter. They posted a photo about it on Facebook at it got 189 likes and 5 shares! The Book Buddies program has gone viral on the internet and talked about in the mainstream media. It was even featured on ABC World News with Diane Sawyer. We love books and we love cats so the Book Buddies program makes us smile. Speaking of cats, it’s Caturday today! Happy Caturday! 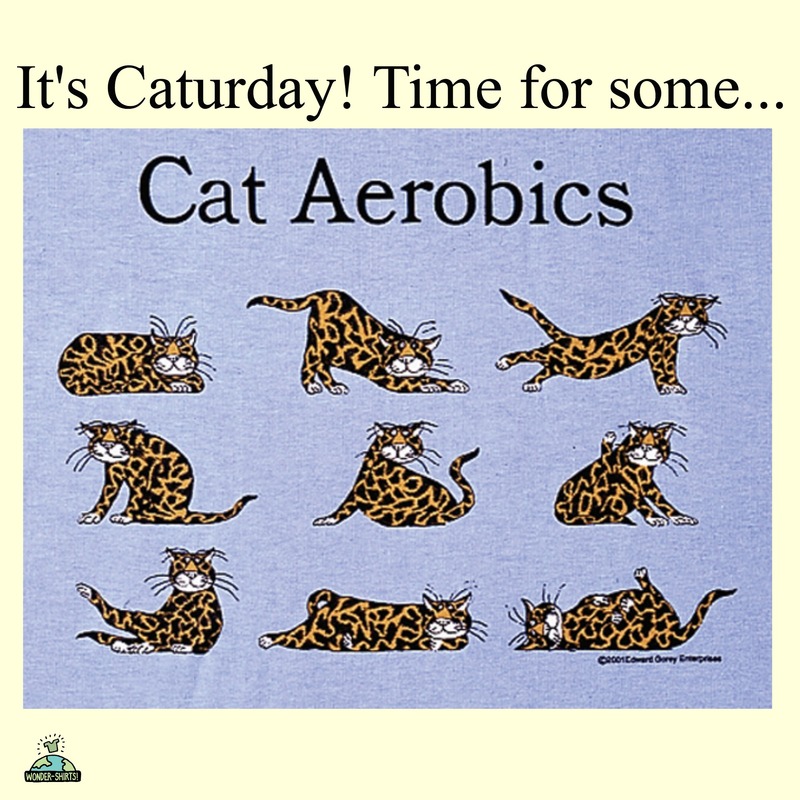 It’s time to do our Cat Aerobics…purr and stretch and meow and reach…lift those tails high in the air…now roll over and roll over and roll over. Good job! Now you are as limber and lithe as a cat! This is one of our Edward Gorey t-shirts. Edward Gorey is a famous illustrator who still has an avid following today. He illustrated many children’s books with his unique and captivating drawings. You can find the shirts pictured in this post at our website. Come pay us a visit at www.wonder-shirts.com. What Makes Children Feel Motivated to Read? Does it Sound Like Chocolate?